Why is this important? Because over a lifetime of saving for retirement, total assets accumulated at 1.5% and 3.0% annual fees are respectively 23% and 46% lower than those resulting from 0.4% fees (Ambachtsheer and Bauer)!Or, because in retirement 1.5% extra annual cost can reduce you standatrd of living by about 30%; if annual market return corresponding to a given portfolio risk is 7.5% is used to determine your annual ability to draw income at the rate of 5% from the portfolio, then paying an extra 1.5% (say 1.8% vs. 0.3% in management fees) reduces your ability to draw income from 5% to 3.5% per year, which is a 30% reduction in annual retirement income! Clearly it is possible to implement a well diversified portfolio very cheaply (<0.3%). Even if you conclude that you can’t (I am not sure why) or won’t do it yourself, you should be able to get professional advice from a fee-only/based advisor at equivalent of 0.5-1.0% annual advisor fee (depending on the size of your portfolio) for a total cost of about 0.8%-1.3%. I think that many people, who can invest a little time, can implement/manage their portfolio themselves and keep their cost-related headwinds to a minimum (even if they initially get launched with a competent fee-only/based advisor who develops an Investment Policy Statement for them). I have discussed Investment Policy Statements (your objectives, risk tolerance, and how to translate that into a financial/retirement plan), Asset Allocation and Portfolio Management under the Education tab of this website. 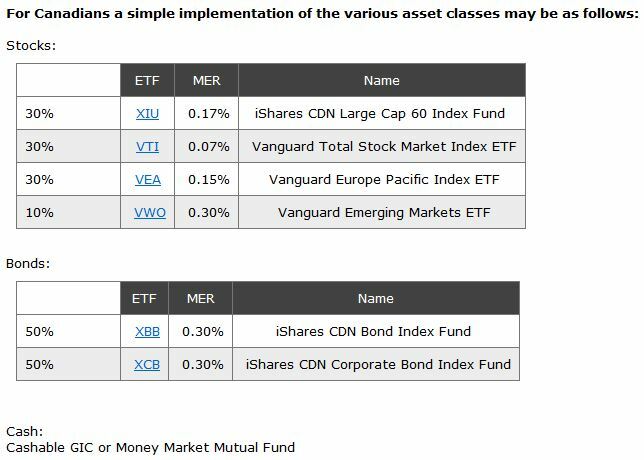 Let’s now look at how one might do a simple and cheap implementation of a primarily ETF based portfolio for a Canadian and a U.S. based investor, if one was starting from scratch. I have chosen to use a 60% stock and 40% fixed income (bond plus cash) mix as the example here, because it is close to what I use and it is for someone with slightly above average risk tolerance. I discuss portfolio risk and the typical impact of portfolio mix at the end of this blog. If you have lower/higher risk tolerance you can increase/decrease the portfolio bond allocation. Let’s first dispense with “Cash reserve” that you may wish to consider. For a working individual who is still accumulating assets for retirement you may wish to have an easily accessible cash reserve equivalent to six months of expenses in case you lose your job; your reserves should be higher if you expect to make/have some major expenses in the next couple of years (e.g. new roof, car…) or need to prepare for even higher expenditures if you are preparing to make a down-payment on a house. Let’s assume for now that 10% of the total assets are allocated to Cash. Note that the total annual cost of this portfolio is 0.21%, plus any transaction costs that you may incur during the year. (This compares quite favorably with Canadian mutual fund MERs of 2-3 %. This difference could lead to a significantly larger portfolio or significantly lower contributions to achieve a given level of assets for retirement.) As far as currency/geographical diversification this portfolio has 58% Canadian, 18% U.S. and 24% rest-of-the-world Canadian exposure. *as noted above Cash may be implemented with either Tax-exempt VMMXX or Taxable VWITX from Vanguard or other similar funds. You can read more about how to build your portfolio in Chapter 13- Defining Your Mix in William Bernstein’s “The Four Pillars of Investing” (The availability of ETFs was relatively limited when this book was published, so most references are to mutual funds, but the concepts are still valid and the explanations are clear. -assuming that you are starting with all cash/fixed-income portfolio and you are planning to retarget to a different mix, then it is advisable (especially is you are re-deploying a significant amount of money) is to do it, not all at once, but over a period of time; for example 1/3 of the funds could be redeployed every 2-3 months. -Market conditions change and that may affect the specific choice of taxable or tax-exempt money market or bond funds for American investors; if fund is for tax-exempt/deferred portion of the portfolio, then the taxable fund should be used as it usually has a higher yield, if however the fund is for the taxable portion of the portfolio, then depending on the investors tax bracket the taxable or tax-exempt fund may yield higher after tax return. 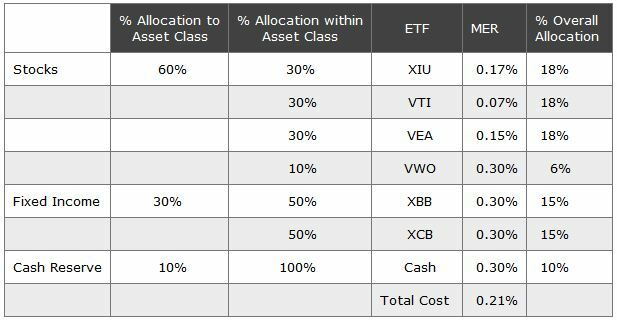 -on the bond asset class, one could use a ladder of 1- 5 year GIC (Canada) or 1-5 year CD (U.S.) in addition to or instead of the bond ETF, depending on the rate differences and the acceptability of the risk of not having access to the money. 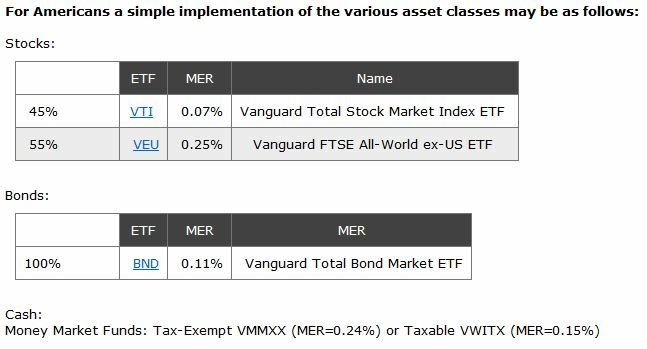 -for instances when a low –cost versions of an asset are available both in mutual fund form and ETF as for example American investors can access Vanguard Total Bond Index either as a mutual fund VMBFX (MER=0.19) or and ETF like BND (MER=0.11), then additional consideration should be given to the transaction cost (likely zero for VMBFX and $10-$30/transaction for the ETF) if automatic monthly investments are made. 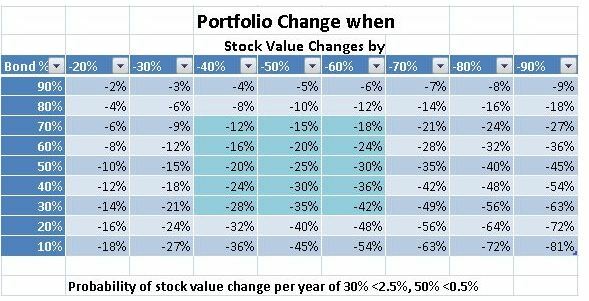 Risk Tolerance First let’s look at the change in a portfolio’s value as a function of percent loss on the stock portion of the portfolio, for various levels of fixed-income (bonds and cash) component in the portfolio (which are assumed to stay unchanged when the stocks lose value). As you can see from the following table, the portfolio loss can range from minimal to significant. One’s risk tolerance is dependent on one’s ability and willingness to take risk. You’ll recall that a bear market is when there is a 20% drop from the previous peak but since 1945 there were two bear markets that exceeded 40% peak-to-trough losses. I have chosen to use a 60% stock and 40% fixed income (bond plus cash) mix as the example above, because it is close to what I use and it is applicable for someone with slightly above average risk tolerance. For the U.S. stock market under normal distribution assumptions there is <2.5% probability of 30% annual loss. Even two of those 30% loss years back to back would “only” result in about 50% stock component drop (hopefully less than that with the geographical diversification), and a corresponding 30% portfolio loss for the 60% stock and 40% bond/cash portfolio. Changing this mix you can change to a portfolio of different level.